THIS I A FREEWARE, FEEL FREE TO DISTRIBUTE IT, BUT AS A FAVOR, PLEASE DISTRIBUTE IT *WITH* THIS README.TXT FILE. Check www.lambda.subnet.dk or www.lambda-design.com for updates and for other skins made by me. Winamp, go to the option-menu and use the skin-browser to select the skin. for WINAMP 2.x an above". I chose to use the name Lambda because; in physic it's the symbol that represents the length of waves, - like sound waves. All my production are related with the symbol Lambda, - this is my final winamp skin so dont expect any new winamp skins from me in the future! If you have any comments, please do not hesitate. Write to me. this skin, and I don not want to see it being abused. Lambda Series is a trademark of Bentzen. Winamp is Copyright © 1997-2000 Nullsoft, Inc. and Justin Frankel. 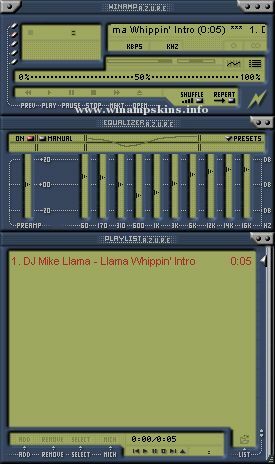 Winamp is a trademark of Nullsoft, Inc.